I’m actually nearer the end than the beginning — my INSANE QUEST to see all the films depicted in Denis Gifford’s big green book of monsters actually looks like it might have an end in sight. 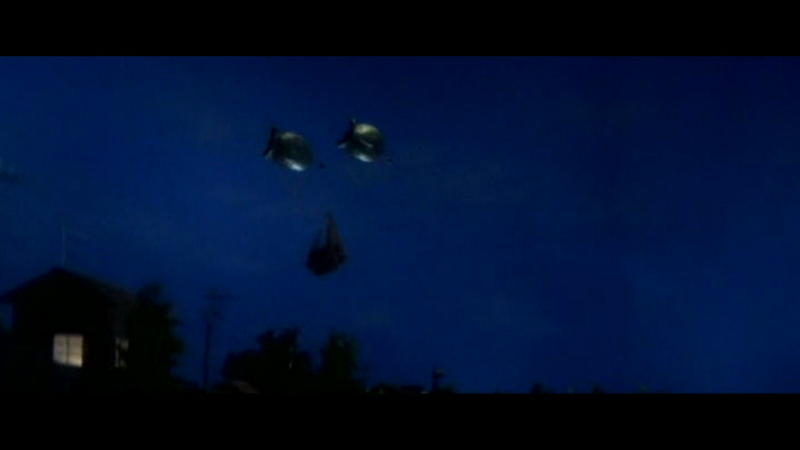 For instance, I realised that GODZILLA VS THE THING is in fact GODZILLA VS MOTHRA, which I’ve seen, which left only two giant Japanese monster movies (kaiju) to watch, GAPPA THE TRIPHIBIAN MONSTER and GAMERA VS JIGER. Both sure to be treats, I thought, since I’d never seen either monster in action, despite having gloated at their images in books like Gifford’s since I was old enough to squawk. 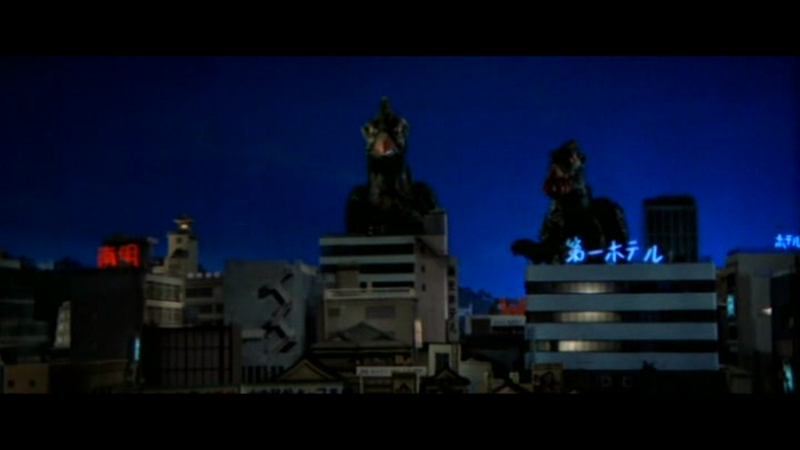 GAPPA came first, an intriguing monster since he stems from the Nikkatsu studio, rather than Godzilla’s progenitors at Toho, and also because there’s three of him. But I’m getting ahead of myself. First let me tell you about my NEW WORD. This is a word you use to describe something that seems to be in the wrong place, like a giant gorilla in downtown Manhattan, and the word is KINGKONGRUOUS. 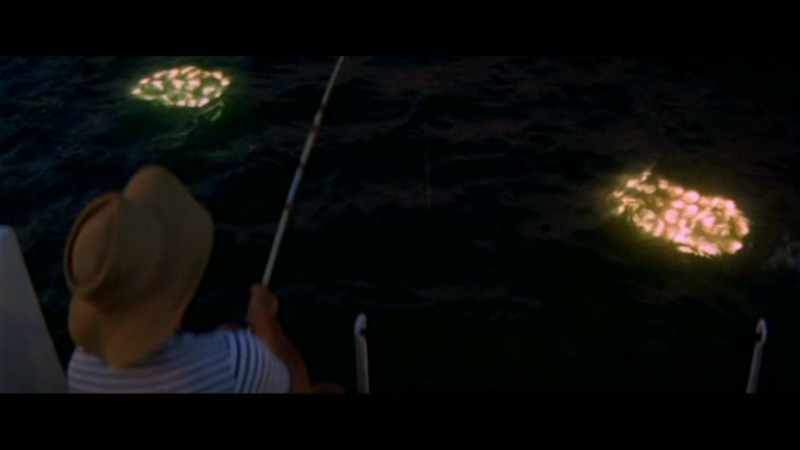 Maybe the film’s one original idea/image — monster eyes watching from the deep. Impressive, especially as it seems to be a real physical effect. I refuse to count “triphibean” as an idea. GAPPA is a film of two halves, both of them stolen. The first half is pure KONG, with a ship full of scientists trawling the pacific in search of undiscovered animals which can be used to populate a new resort, improbably named Playmate Island, which is the dreamchild of a magazine magnate (mag-mag for short). Hitting the ground running, director Harayasu Noguchi (whose career seems to have come to an end the year of this film’s release) introduces us to this gang of clichés (soulful girl, staunch fellow, annoying comedy dweeb) already en route to Obelisk Island (so named for the mountain shaped like a slow-witted Gaul), and sets up their purpose with a quick scene back on the mainland. 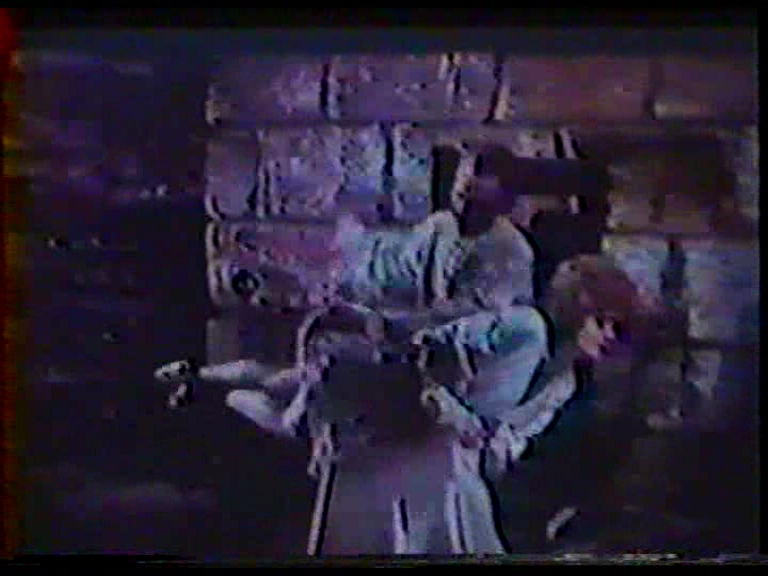 All that out of the way, they can come ashore on the monster-infested isle only ten minutes into the film, thereby making me morally certain that Peter Jackson has never seen this film. Call it my woman’s intuition. Oops — aren’t you supposed to REPLACE the blue screen with something? 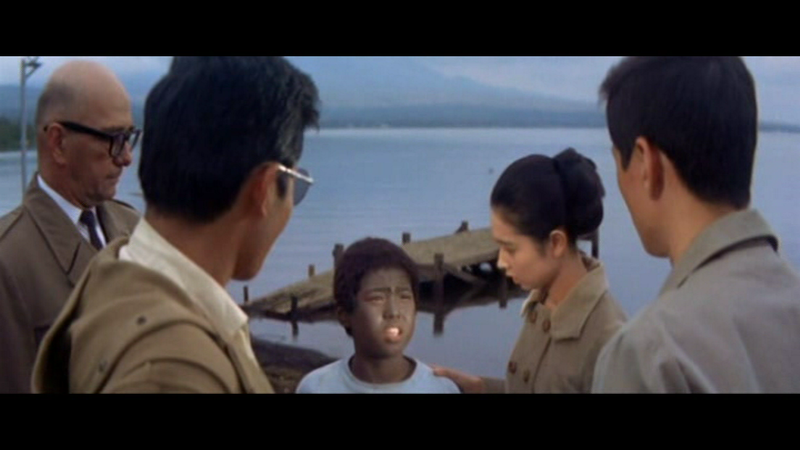 Thrillingly, the island is populated by Japanese extras in blackface, and a particularly disturbing little boy in an Afro wig, who warns them not to disturb Gappa, but being scientists they’re unaccustomed to listening to the simple native wisdom of small boys in afro wigs, so they go blundering in. 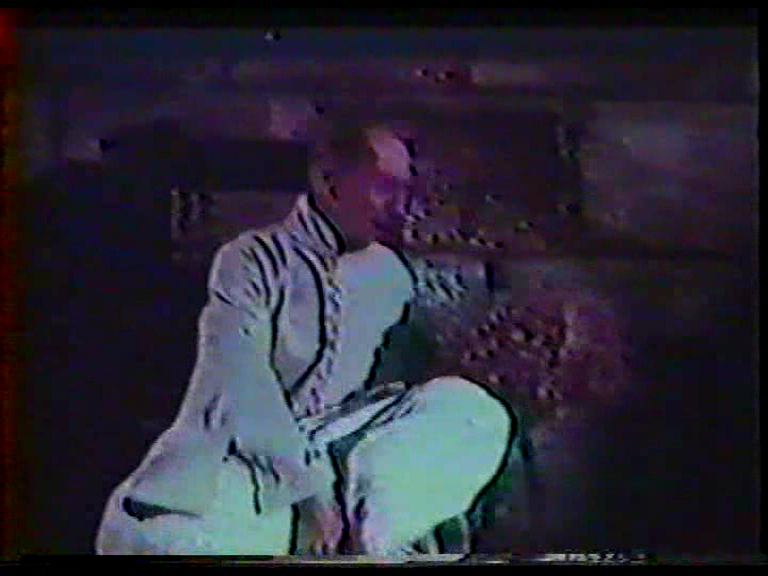 An earthquake swiftly clears away the statue blocking their path and cracks open a massive egg. 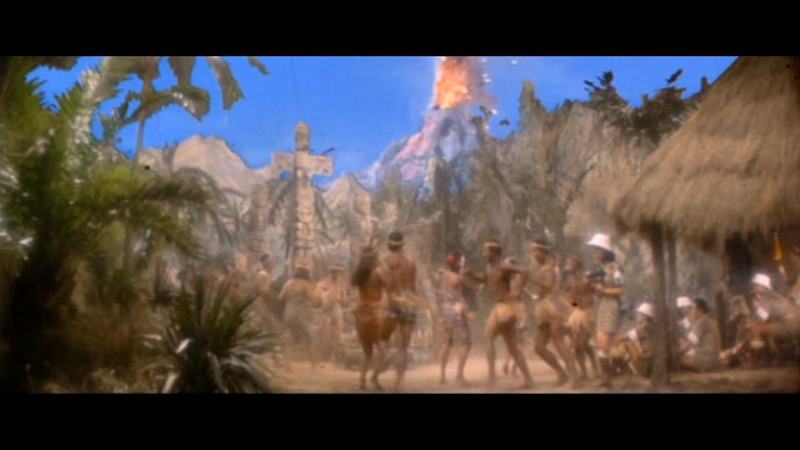 Behaving slightly more sympathetically than Sinbad’s men with the Roc egg, they abduct the gallumphing newborn Gappa and set sail for Tokyo (Playmate Island now turns out to be a big land-mass-shaped red herring, never to be spoken off again). Now the movie makers can stop ripping off KING KONG, although they don’t, and start ripping off GORGO, the British entry in the kaiju stakes, where a mother monster tramples London in search of its young. In GAPPA, we have a mother AND father beastie, stomping all over the map of Japan while the authorities refuse to even consider giving up the infant monster, until finally they do. At this point I was perversely rooting for little Gappa Jnr to join forces with Ma and Pa Gappa and continue ravaging the nation until there’s not a three foot balsa skyscraper left standing. To stave off the inevitable tedium as the monsters, looking not unlike Sam the American Eagle from The Muppet Show, stagger disconsolately around a dusk-lit diorama, I started fantasising about my dream project, a shot-for-shot remake of GAPPA in which all the scenes would be the same, with only the sets changed around. 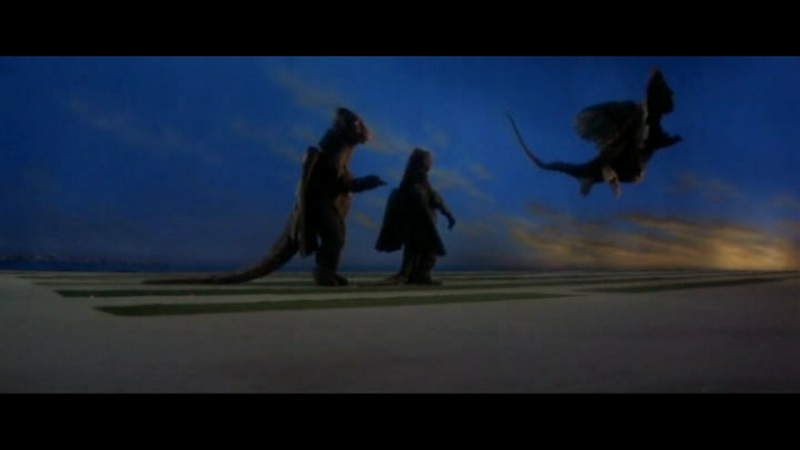 In this version, the human actors, grown grotesquely swollen, would play their scenes amid the miniature scale replicas of island jungles and Tokyo streets, while the monsters would lumber around in conventional sets, bumping into sofas and barking their rubbery shins on coffee tables. If we can’t get the rights to this one, let’s just remake AS GOOD AS IT GETS, but with the entire cast in rubber monster costumes. “You make me want to be a better man.” Poignant! “Whee!” Baby Gappa recreates the opening of LA DOLCE VITA. It seemed timely to feature this intertitle from the early Doug Fairbanks starrer FLIRTING WITH FATE, an uncredited adaptation of Jules Verne’s The Tribulations of a Chinese Man from China. 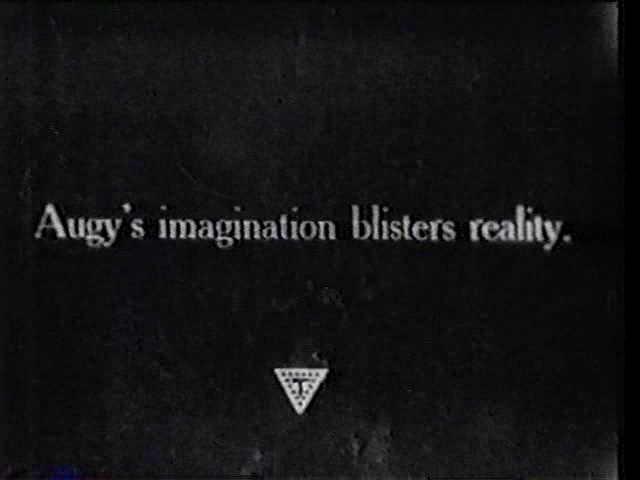 (The title card refers to struggling artist Augie, played by Doug.) It’s an old story — a hapless loser hires an assassin (here, the artistically-monickered Automatic Joe) to end his misery, but then his luck changes, he wants to live, but he can’t find the gunman to call off the hit. Robert Siodmak made the story as LOOKING FOR HIS MURDERER in Germany from a Billy Wilder script, again without crediting the source, and Philippe de Broca adapted it with credit, and with the inevitable Jean-Paul Belmondo in the lead. The appearance of this movie put paid to Richard Lester’s plan to cast Ringo in the story and use it for the Beatles’ second film, and so we got HELP! instead. This may be my favourite intertitle of the year. It refers to the fantasy sequences of Automatic Joe snuffing a series of stand-ins in visions that pop up before Doug’s mind’s eye, and are shared by us. This seems like fairly advanced film narrative for the period. As a result of these fantasy murders, Doug spends the middle of the film fleeing in terror from anything that’s around, including the correspondence-school detective who’s trying to protect him. A long sequence of two characters in false beards taking fright at each other and at any other bearded men, has a real feel of vaudeville on acid. 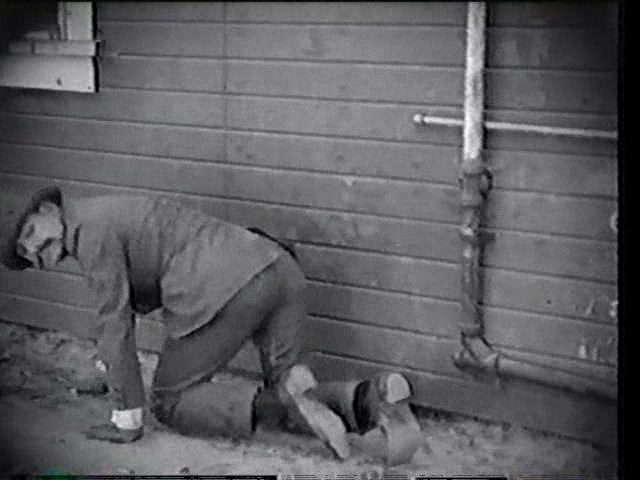 Automatic Joe (George Beranger) is guilt-stricken because he has accepted fifty bucks to snuff a man, and the fellow still breathes. I am besotted with this image, especially the deeply-scored wallpaper in the background. Doug attempts to be inconspicuous.